sofsea – Page 3 – Sofia. a paradox of a girl. los angeles. 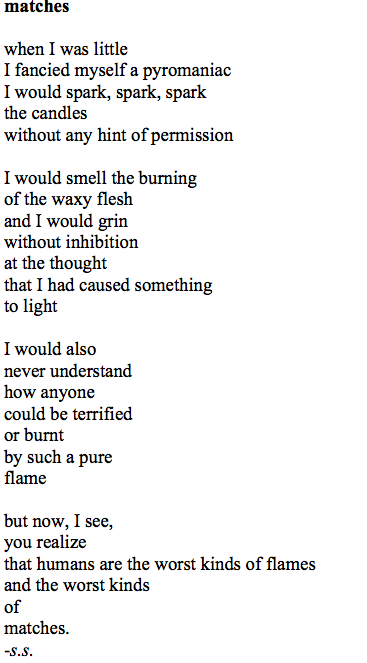 Here is a poem, by me. It takes me much pain to admit this, but yes, I am an avid fanfiction reader. One Direction only, of course. See, I discovered fanfic almost three years ago, after first becoming a Directioner. I hadn’t understood, or really even taken the time to check out, the obsession until I clicked on my first Wattpad discovery. And it was all downhill from there. I do not want to tell you all what my favorite fanfics are, because if you were to search them up and read them, for me that would be mildly humiliating. What I will acknowledge is that most of the fics I obsessively indulge in are absurdly popular on and off the internet. See, one certain Harry Styles fanfic has been developed into a book series. Can you believe that? The all-powerful internet, meshed with the unbreakable and insurmountable power of fandoms, has turned into one of the most powerful toolkits for writers and readers today. What is it about fanfiction that makes so many teenagers, so many people, go perhaps literally insane with weird and unpredictable emotions? We all have that one brilliant ambition, our dream, to do whatever we are passionate about while having someone alongside us. Our other half. Our person. And yes, of course, when we young people haven’t found that person yet, we imagine them to be someone we idolize. Celebrities. We need someone to put our hope in, so we chose those who we perceive as perfect. Someone, perhaps, like One Direction. Of course, we don’t actually know these people. I could read every tweet, every Instagram caption, every article, learn as much as I possibly can about one of these celebrities and I would still not truly know them, every inch of who and what they really are. To us fans, they have no fatal flaws, no hamartia to dwell on. To us, their “flaws” are small and make them even more perfect. Of course this isn’t the truth. I desperately wish I knew those five boys, but in all honesty, I really don’t. So fanfiction allows us a gateway to our dreams, written out on screen for us to bask and live in. We live out our dreams in a story that has been so generously shared and created for us by someone carrying the same dreams. We share our sometimes seemingly insanely unrealistic dreams, passions. It makes us all feel as if we know these celebrities, like we actually might have a chance with them. We feel like we can really connect to them, relate to them in different and uncommon ways. Of course, the personas of these people that we read about probably are not even remotely true. They’re guesses. They’re what we want them to be, our deluded illusion of who they are. But they are truly just people, tragically and numerously flawed, screwed up humans, like us. As Niall Horan says (indeed, I memorized this quote), they’re normal people with abnormal jobs. Maybe that’s so, but guess what! I don’t give a damn if it’s a phase, maybe it is (trust me, it’s not, it’s lasted almost five years) but what does that even matter? Why does it matter, if I truly and deeply love something, how long that love lasts? It’s very damn rare to actually find a feeling, in adolescence, that makes you unspeakably happy. Fanfiction is the nearest escape route to calm. The exit sign of the internet. Adolescence is the constant stage of always searching for something, but never really knowing what that something is. All I know is that I want to want something that will make the muted voice inside of my soul scream so loudly that I will be deaf to anyone else’s voices but my own, and those who I have to try to hear. And though I have not found my passion yet, reading fanfic helps me have a passion. I am a crazy Directioner because they let me feel something great, something beautiful and maybe reckless and naive, but it’s still something. I feel that too often, teenagers feel like we have to be silenced and indifferent to everything. What’s wrong with feeling insane once in a while? What’s wrong with turning that insanity into something good, something that you can share with all of those other people who feel the same way? Feelings aren’t going anywhere, are they? So why pretend that we don’t love something all for the sake of being perceived as indifferent? To reiterate all of my endless rambling, fanfiction is the blissfully accessible gateway to feeling things other than nothing. It’s acceptable, when we read/write/devour fanfiction, because all of our “crazy” feelings can be channeled into writing. We’re in our own world of feeling happy. It’s quite incredible, the way we have taken our favorite idols and turned them into our own works of art. And of course, there’s always going to be badly written, idiotic/offensive fanfic, but there’s also always going to be quality, incredible writing out there. One Direction, as well as many other celebrities, have inspired so much… art and change and pure unity, within people, mainly teenage girls, but for me, being a teenage girl is EXACTLY the time when I most need this inspiration, to keep on going, to simply keep breathing. Being a teenager, much like being a messy human, is sort of impeccably hellish, as it should be. And fanfiction serves the purpose of giving us a little escape from hell into something better. It inspires something in me, to start something, to… believe that one day, I will be able to have my person. Preferably, one out of those five boys. There is a silently prevalent issue that I feel so outrageously strongly about, an issue that has consistently pestered at me for a long period of time, an issue that I have unequivocal passion for. This issue is the stigma surrounding mental illness. Mental illness is an extremely misunderstood and universal problem in society, one that is very commonly and immensely misinterpreted as well as misconstrued throughout not only the United States, but many other countries, such as the UK, as well. My fueled passion lies in correcting the many misconceptions about mental illness, without blame or pointing haughty fingers at those who simply do not understand. I am a big advocate for empathetic education, meaning that I wish for everyone to be able to empathize and at least attempt to understand one another, rather than living in oblivious ignorance with no regard for those who struggle to be heard. I truly hope that you all will at least continue to read my humble little piece here, because even if this issue is one that doesn’t seem to be of utmost importance or interest to you, trust me, it is so important. It may not seem to affect you, but it does, indeed, affect many, many people in this world. In fact, nearly one in five people in the United States are living with mental disorder. It is a silently prevalent health and cultural issue in our world. And I want to expose you to the truth of the problem, without the typical stereotypes that surround these illnesses today. I have no room for stereotyping here. I will first start by stating this: I am not going to write about my personal struggles here, but rather, I will attempt to encompass the many problems that I have noticed within the stigma surrounding many different mental illnesses. I am so passionate about this problem because, like any other stereotype, it really does hurt people. All of the prejudiced isms in the world are harmful to our society, and this, most definitely, is one of those. I wish I could say that we were more informed about this less talked about issue in school, or somewhere we are forced to listen, but unfortunately, we aren’t. I think that this is the root of the problem: we don’t fully educate people on the severity of this problem. I hope I can educate you all, a little bit- I have tried hard not to write about this, but it’s been bothering me for so long, that I decided I just had to. And I’m not embarrassed for my feelings about this issue, because I believe that you should all understand it as I have personally understood it. You have to know the importance of this. I mean this in no hurtful way towards anyone (unless you purposely try to hurt those with mental illness, than yeah, you’re not such a great person), as I myself admit I have been bad at calling people out on this, but this HAS to stop. I am not blaming any of you, we’re all guilty of misunderstanding, we’re only human. Humanity has a long history of complete and blatant ignorant misunderstanding. And I am assuming that those of you who use obsessive compulsive disorder as an adjective don’t do so to intentionally offend anyone, but most likely because you don’t understand what you’re saying. And I do get that, completely. I’m here to clear all this misconception up. Obsessive compulsive disorder, in no way, can ever be used as an adjective. 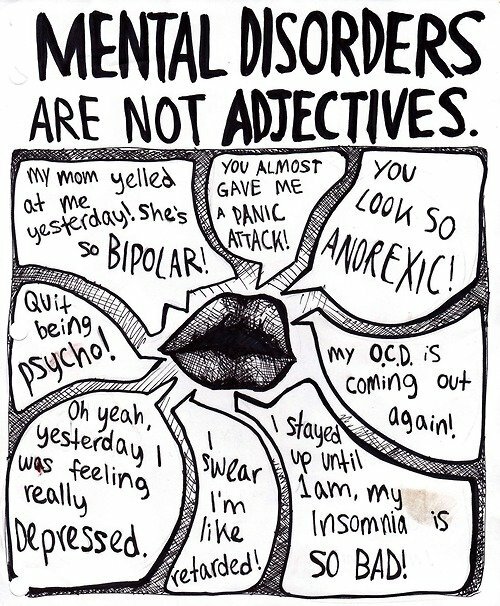 Besides the rather obvious fact that saying “I’m so OCD” isn’t grammatically correct, there is a huge issue with using mental disorders as adjectives. Obsessive compulsive disorder is, by definition: (this is from the New York Times) Obsessive-compulsive disorder (OCD) is an anxiety disorder in which people have unwanted and repeated thoughts, feelings, ideas, sensations (obsessions), or behaviors that make them feel driven to do something (compulsions). Often the person carries out the behaviors to get rid of the obsessive thoughts. But this only provides temporary relief. Not doing the obsessive rituals can cause great anxiety. A better and more detailed explanation of this paralyzing illness can be found in the powerful Hank Green video, explaining in depth the illness, which I recommend you all must watch (it’s Crash Course, it’s short and simple). Hank explains a mental disorder, such as OCD, as follows: “ A deviant, distressful, and dysfunctional pattern of thoughts, or behavior, that interferes with a person’s ability to function in a healthy way”. One of the most important things that Hank says about obsessive compulsive disorder is this: “We tend to minimize those disorders, using them as nicknames for things that people do, think, or say.” THIS is exactly what I mean when I say that people use mental disorders as adjectives. Obsessive compulsive disorder is a seriously intrusive illness, that does not cause cute quirks in people, but rather debilitating anxiety and worry that causes victims of the illness to sometimes be unable to leave their home, or even unable to participate in a normal life, due to the severity of the anxiety. We cannot trivialize and downplay these disorders to be used as words to describe, well, anything. We can’t. It’s hurtful and ignorant and uncomfortable for those who actually have these disorders. Many people think that being neat or orderly, or very clean and liking to have things a certain way, constitutes the use of the word OCD. This could not be farther from the truth. Another thing Hank brilliantly points out in the beginning of the video, is how he makes jokes about horrible diseases such as polio, and asks if you’ve ever made those sort of illness-related jokes to your friend. And then he goes on to say that no, you probably haven’t. This may sound farfetched to you, but using mental illness as an adjective is just as harmful as using cancer or a physical illness as an adjective. Mental illness is a terrible, crippling thing that intrudes a person’s ability to simply live. In many cases, in fact, mental illness causes one to take their own life. It is a complete and total loss of control over one’s mind, just like a physical illness is loss of control over one’s body. I will sum the invaluable importance of my words into one simple summary: Being a generally fastidious and orderly person, or rather, being fastidious about certain things, or liking to have things a certain way, does not, in any way, mean that you have obsessive compulsive disorder. Another commonly misunderstood mental illness is bipolar disorder. I have heard, countless times, people say their teacher is “so bipolar” or, the weather today is “bipolar” because it’s unpredictable. This is a problem, because bipolar disorder is an incredibly serious mood disorder, which is marked by “emotional extremes and problems in regulating them”. This disorder was once known as manic depression, which you might be familiar with. Bipolar disorder is defined as follows, according to the National Institute of Mental Health, is as follows: Bipolar disorder, also known as manic-depressive illness, is a brain disorder that causes unusual shifts in mood, energy, activity levels, and the ability to carry out day-to-day tasks. Symptoms of bipolar disorder are severe. They are different from the normal ups and downs that everyone goes through from time to time. Bipolar disorder symptoms can result in damaged relationships, poor job or school performance, and even suicide. I will reiterate what is also true with what I have said about OCD: shifting from happiness to sadness quickly does not constitute bipolar disorder. In fact, using this disease as an adjective is so incorrect because people with bipolar disorder have extreme manic episodes where they experience both mania and depression, which can cause them to do extreme and impulsive things, such as emptying their bank account, or even in many tragic cases, commit suicide. We must end this widespread and prevailing stigma of mental illness. Remember that mental illness rarely, if ever, looks like what you see in the movies and in pop culture. Ignorance is the cause of such misunderstanding, and I’d like to change all of your perspectives on this ignorance that perhaps you were unaware of. Next time you are about to tease your friend about being so OCD about her color coordination, think twice. There are people living with these illnesses, and the insult of their crippling disorders being trivialized is painfully silencing. I know how difficult it is to speak up against this, as well, I myself have had much trouble with it, but in the end, you are not blaming the person misusing the word: you are simply informing them of their misunderstanding. And that is nothing to be embarrassed about, in fact, I believe it is something to be very proud of. Raising your voice is no easy feat, and I commend you for being brave and intelligent enough to educate others. I advise you all to end this common stigma with mental illness. Mental illness is horribly insidious and can silence a person living with one, as the misunderstanding around it can cause one to not want to admit to their illness. You may know someone with a mental disorder, or perhaps you know someone but are unaware of their illness because they feel like they have to hide it. I encourage you to take small steps to finally end the prejudice, and this is truly so easy to do. Stop using mental illnesses in trivializing manners, stop using them as adjectives, and start listening to those who have the illness without bias, and with full respect. This was only a brief and blunt piece about all of this, and so, I suggest you research much more about this issue, because there are abundant charities for this as well as many ways that you can help. I promise, understanding this stigma will change your perspective remarkably. I understand mental illness so much better now, as well as being able to recognize bias and misunderstanding in general. It’s really damn important to know how to do this, no matter how hard it may be.